Note our Single Sheet ordering instructions have recently changed. 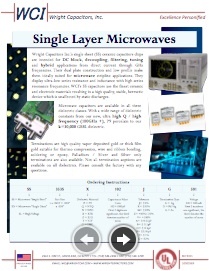 Please see the SLC Microwaves brochure for details. Wright Capacitors Inc.’s single sheet (SS) ceramic capacitors chips are intended for DC block, decoupling, filtering, tuning and hybrid applications from direct current through GHz frequencies. Their dual plate construction and low profile make them ideally suited for microwave stripline applications. They display ultra-low series resistance and inductance with high series resonance frequencies. WCI’s SS capacitors use the finest ceramic and electrode materials resulting in a high quality, stable, hermetic device which is unaffected by static discharges. Terminations are high quality vapor deposited gold, suitable for thermo compression or ultrasonic wire bonding, soldering, or epoxy mounting. Pd Ag terminations are also available. Microwave capacitors are available in all three dielectric classes. With a wide range of dielectric constants from our new, ultra high Q / high frequency (100GHz +), P9 porcelain to our k=30,000 GBBL dielectric. Terminations are high quality vapor deposited gold or thick film gold suitable for thermo compression, wire and ribbon bonding, soldering or epoxy. Palladium / Silver and Silver only terminations are also available. Not all termination options are available on all dielectrics. Please consult the factory with any questions. All units tested to MIL-PRF-49464. Axial-beam leaded, leaded and coated, circular discs, cap arrays and tight tolerances are also available. Standard disc sizes are .045”, .050”, .060”, .080” and .120” O.D. (all =/-.005”). High voltage single layer (SL’s) up to 20KV are also available. Please consult the factory for any special requirements. SS = Microwave "Single Sheets"
SD = Microwave "Single Discs"
SL = High Voltage Part Size i.e. First 2 numbers are significant, the third denotes the number of zeros.